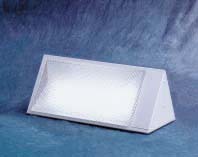 Sun Light Jr. Light Box | BioBrite, Inc. The Junior Light Box is best when space is at a premium. Up to 10,000 lux (at 14″) of broad spectrum, UV free light in a large shoebox size unit makes it a convenient choice. This sturdy design is constructed from durable white aluminum.